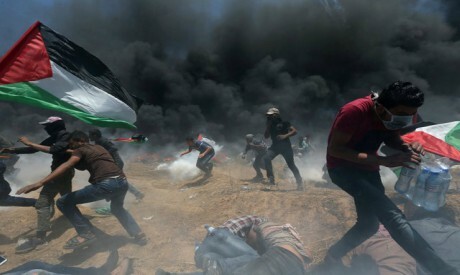 Israeli occupation troops shot dead dozens of Palestinian protesters on the Gaza border on Monday as the United States opened its embassy to Israel in Jerusalem, a move that has fueled Palestinian anger and drawn foreign criticism that it undermines peace efforts. It was the bloodiest single day for Palestinians since the Gaza offensive in 2014. Palestinian Health Ministry officials said 58 protesters were killed and 2,700 injured either by live gunfire, tear gas or other means. The bloodshed drew calls for restraint from some countries, including France and Britain, and stronger criticism from others, with Turkey calling it "a massacre". The White House declined to join in urging Israel to exercise restraint and pinned the blame squarely on Gaza's ruling Hamas group - backing Prime Minister Benjamin Netanyahu, who described the Israeli military's actions as self-defence of his country's borders. Israel regards all of the city, including the eastern sector it captured in the 1967 Middle East war and annexed in a move that is not recognised internationally, as its "eternal and indivisible capital". Kushner said it was possible for both sides in the Israeli-Palestinian conflict to gain more than give in any peace deal. "Jerusalem must remain a city that brings people of all faiths together," he said in a speech. But Palestinian President Mahmoud Abbas said the United States had opened an "American settlement outpost in East Jerusalem". He called the deaths in Gaza a massacre and announed a general strike on Tuesday. In Gaza, Palestinian protests quickly turned into bloodshed. Tens of thousands had streamed to the edge of the coastal enclave's land border, some approaching the Israeli fence. The protests are scheduled to culminate on Tuesday, the day Palestinians mourn as the "Nakba" or "Catastrophe" when, in 1948, hundreds of thousands of them were driven out of their homes or fled the fighting around Israel's creation. Netanyahu took to Twitter to direct the blame at Hamas. "Every country has an obligation to defend its borders," he wrote. "The Hamas terrorist organisation declares it intends to destroy Israel and sends thousands to breach the border fence in order to achieve this goal. We will continue to act with determination to protect our sovereignty and citizens." Hamas denied instigating the violence, but the White House backed Netanyahu. "The responsibility for these tragic deaths rests squarely with Hamas. Hamas is intentionally and cynically provoking this response," White House spokesman Raj Shah told a regular news briefing. The 58 deaths included at least six people under 18 years of age, including one girl. The total number of fatalities since a series of protests to demand Palestinians' right to return to their ancestral homes in Israel is now 103. Throughout the day sirens of ambulance vehicles carrying casualties to hospitals wailed almost non-stop. In Gaza mosques, loudspeakers mourned the dead, who were carried for burial in funeral marches. Trump's recognition of contested Jerusalem as Israel's capital in December outraged Palestinians, who said the United States could no longer serve as an honest broker in any peace process with Israel. A senior Hamas leader, Khalil Al-Hayya, said at a border encampment that Monday's protest was timed to coincide with the "deplorable crime of moving the US Embassy to Jerusalem". He said: "Our people went out today to respond to this new Zionist-American aggression, and to draw by their blood the map of their return." France and Britain called on Israel to show restraint, with French President Emmanuel Macron planning to talk to all involved parties in the region over the next few days. UN Secretary-General Antonio Guterres said he was "deeply concerned" by the events in Gaza and said it showed the need for a two-state political solution. Britain said it had no plans to move its Israel embassy from Tel Aviv to Jerusalem and it disagreed with the US decision to do so. French Foreign Minister Jean-Yves Le Drian said the US move flouted international law. Other responses to the assault were stronger. Regional power Turkey accused Israeli security forces of carrying out a massacre and said the US Embassy move had encouraged them. More than 2 million people are crammed into the narrow Gaza strip. "The policy of Israeli authorities to fire irrespective of whether there is an immediate threat to life on Palestinian demonstrators in Gaza, caged in for a decade and under occupation for a half century, has resulted in a bloodbath that anyone could have foreseen," Human Rights Watch said. Palestinian Prime Minister Rami Hamdallah, in a statement on Monday, accused the United States of "blatant violations of international law". "Choosing a tragic day in Palestinian history (to open the Jerusalem embassy) shows great insensibility and disrespect for the core principles of the peace process," Hamdallah wrote.